What is the definition of a "usage" for Show Usages? Does Show Usages locate uses of all three methods? Or only of the method with the corresponding signature? Suppose I select the zero-argument declaration of Mill and Rename it. Will we also rename the one-argument and two-argument methods? Second, consider two unrelated classes, each of which have a method with the same name. If I select the declaration in FactoryModel, will we also find usages for RiverFloss? Suppose I rename the method in FactoryModel by selecting Mill() in the declaration. Will I also rename the method in RiverFloss? currently, AppCode finds only usages of the exact symbol under the caret (no overloads). 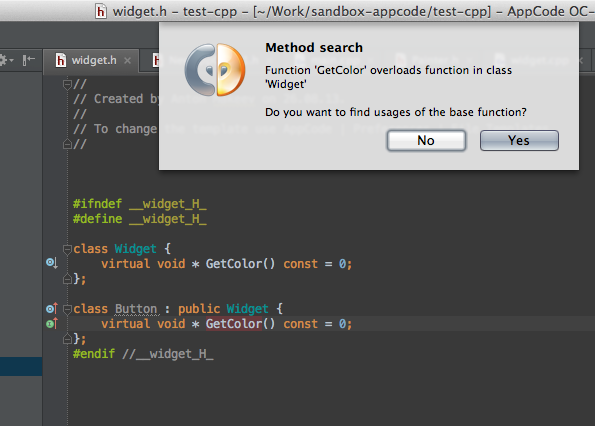 Here is a feature request to also allow findind overloaded functions. You can also check this blog post for other Find Usages tips. To expand on this a bit, here are two methods I'm look at right now. In the old days, we used the first version. Now, we're in transition to the second, which returns an object instead of the ugly pair of doubles. If I understood you correctly above, this should NOT be a usage of GetPosition(). Is my problem (a) I'm selecting the wrong text and confusing AppCode, (b) misunderstanding Find Usages, or (c) something else entirely? thanks, that's a bug in AppCode, here is a report you may follow.